Any motorist who has attempted to park in a busy lot knows the frustration of seeing a single car taking up two spaces. 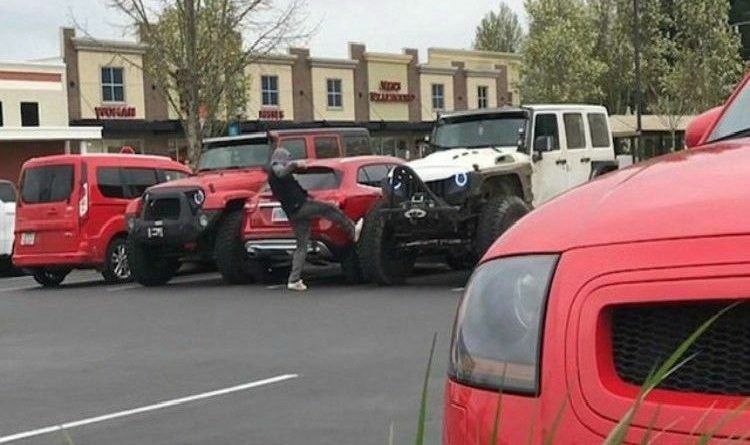 However, a prank video taken by Instagram user Rough Jeep decided it was finally time to teach these inconsiderate parkers a lesson — and maybe prevent future occurrences. After seeing a red Mercedes Benz taking up two parking spots in front of a Best Buy, the pranksters decided to box him in, so that when he returned, it would be impossible for him to open the car doors. As the Benz driver returns, he notices that his car has been wedged in. The pranksters, who have been hiding behind a nearby car, can be heard laughing as the Benz driver walks around looking at the predicament, throwing up his hands and kicking the tires on the Jeeps. Watch what the driver of the boxed-in Mercedes does in the video below. It is not clear whether the prank was set up or genuine.